The Heartbleed security hole was introduced when an extension was added to the OpenSSL project way back in December 2011. It’s conceivable that astute hackers may have been exploiting the problem for years! At the time the developers committing an extenstion to the project didn’t detect a potential bounds-checking problem. 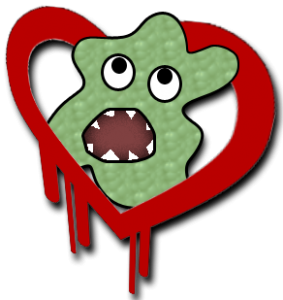 The name “Heartbleed” is derived from the fact that this new extension handled TLS “heart beats”. Essentially versions 1.0.1 through 1.0.1f of OpenSSL are affected by the bug and allow hackers to potentially extract chunks of private data by sending malformed packets and getting back the contents of raw memory buffers. Unfortunately for us, OpenSSL is the most widely used open-source implementation of secure sockets layer and is included with many operating systems (dozens of modern linux distros). This particular blog post covers my experience patching a potentially vulnerable VPN that I manage when I’m not coding. The VPN is based on OpenVPN community edition and it turns out OpenVPN may have been a lot more “open” than I expected! However, this will only give you the version of the default .exe on your system path. It’s important to dig out every vulnerable version resident on every system for optimal security. If any version is 1.0 or below it’s OK, if it’s 1.0.1g or above then it’s also fine. Anything else is potentially vulnerable. Sometimes the version command will only list the major version ie. 1.0.1 (without the letter for the minor version). You can double-check the minor version by looking at the “built on” date: if it’s more recent than 7 April 2014 your version is OK.
On my Windows laptop there were three different copies of openssl: the default one being used by OpenVPN, an unused copy that may have been bundled with some other software, and a copy that came with some Git tools. The Git version was 0.98 so didn’t feature the TLS Heartbeat extension, and therefore wasn’t affected by the vulnerability. The other version that had been bundled with some software wasn’t something I used so I simply deleted it. The version that was being used by OpenVPN needed to be removed too. ..but by the time you read this there may be an even newer version out there. To ensure that this new version takes effect and no out-of-date version remains active in memory, the safest, cleanest and easiest thing to do is reboot the server. Both steps may take a while to update systems fully and you may get confirmation prompts for some packages during the upgrade process. Once the systems are upgraded, all services using libssl must be restarted. As with the CentOS server, the safest, cleanest and easiest way to guarantee that this occurs is to reboot your client system. After openssl has been updated it’s time to create new keys and certificates for every OpenVPN server and client. TThis is no different from the normal process of key/cert generation, but must be done, because all existing keys and certificates have to be treated as compromised. Producing replacement keys and certs and distributing them to the client machines can take a while. After every system has had its keys and certs replaced, you need to go through and change all your passwords. If you don’t already have one, you should seriously consider having a password change policy in place. It has to be assumed that there will be other vulnerable openssl systems out there and any passwords used with these systems could be compromised. Frequent password changing is probably the safest thing to do until you can be sure that no clients will be connecting to insecure openssl connections. I think it’s great that this flaw has been picked up and is largely thanks to the fact that the OpenSSL project is open-source. But it requires a stack of work to re-secure a compromised system, and it’s impossible to know if the system had been compromised in the first place. It is also a pity that OpenSSL ever got released with such a fault. One of the wonderful aspects of open-source projects is that lots of pairs of eyes get to review the code, hopefully increasing the chance that any security flaws will be picked up prior to release. But on the other side of this coin, open-source software is often contributed to by numerous developers, and sometimes the bigger picture can be overlooked when an increment patch is introduced. Furthermore, hackers are able to scrutinise the source code themselves, potentially picking up on any inconsistencies that can be exploited. We have to stay vigilant, and deal with these problems as quickly as possible when they arise.